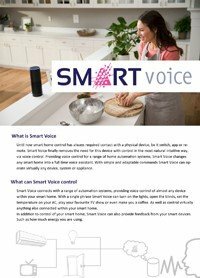 Smart Voice is the new platform that is changing the industry. It connects with a range of automation systems, providing voice control of almost any device within your smart home. With a single phrase Smart Voice can turn on the lights, open the blinds, set the temperature on your AC, play your favourite TV show or even make you a coffee. As well as control virtually anything else connected within your smart home. In addition Smart Voice can also provide feedback from your smart devices, such as how much energy you are using or the current temperature.